This range of precision high voltage modules has outputs that provide a low ripple, high stability source of high voltage for photomultiplier tubes, electron gun, nuclear and other applications. Control of the output voltage is by internal potentiometer or by an external 10 volt analogue control voltage. The units are pin compatible with the medium stability KS and 100 watt HW ranges. All units are short circuit proof and use proven linear regulator techniques to drive a high frequency FET oscillator and ferrite high voltage step-up transformer. The power supplies are constructed from conservatively rated components with the reliability further enhanced by information gained over many years of field operation. Positive, negative, and electrically reversible outputs are available at voltages from 1kV to 30kV. This reversible HPR version has a latched output and can only be changed when the output is set to zero. 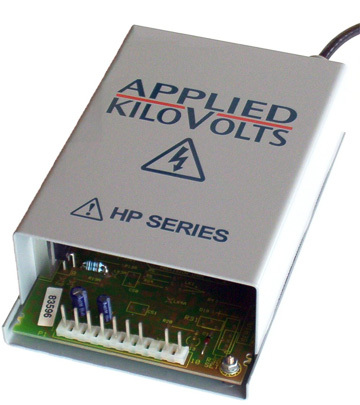 Please see the HPZ range for zero crossing reversible (bi-polar) units. We manufacture a large number of special versions of these units and would be pleased to discuss your application with you. The HPR Series is now UL recognised (E254121): HP001R, HP2.5R, HP005R, HP010R. +24 volt d.c. +10% at less than 1A. Negative input terminal common to HV earth return. Less than 10ppm of maximum voltage for input changes of 1 volt. Flashover and short circuit proof. Re-entrant current limit. Typically 0.01% per hour, measured at constant input voltage, load current & load current & ambient temperature after 1 hour warm up. 10V analogue signal. (0 to +10V gives zero to maximum output, tolerance ±2%). Input impedance >100Kohm. OPTIONAL - INTERNAL or EXTERNAL potentiometer control. Voltage monitor: 0 to +10V represents zero to maximum output, tolerance ±2% (Source resistance 10k). Stack Return - Current monitor: Option available on all units. Note: simple stack return current monitor includes the internally used feedback current. 0-10V represents zero to maximum output, tolerance ±2%, offset ±0.1% of FS. Note - Precision current monitor removes internally used feedback current, buffers and scales the output. Steel case for low radiated magnetic field. Oscillator frequency can be locked to a suitable external frequency. HP001R, HP2.5R, HP005R have M4 studs. By 0.5 meter screened cable (HP020R, HP030R 1 meter). N.B. Reducing the cable length may increase the ripple voltage. Molex 12 pin, mating connector supplied.